In a world with more than 200 million people blocking ads, it is no wonder the online ad industry is facing a loss of over $22 Billion annually. Believe it or not, your ad revenue is being hit due to Ad-Blockers. Even though as users we like an ad-free online experience – but as publishers, it is the worst thing that could happen to your website. Depending on your niche, up to 26% of your visitors could be using Ad Blocking software while viewing your website. That translates to 26% lost ad revenue that could have been in your bank account. This brand new, freshly baked, Ad-Sense theme detects the use of ad blocking software and asks users to whitelist your website. You can set it up to hide all content for ad block users, hide partial content, or simply show a floating box to remind them to stop the ad blocker on your particular website. Once your website is white-listed, they can continue enjoying your content. Not just that, though, This theme have optimized for best CTR and ad placement. So, you know that you are making the most amount of money with the number of visitors you are getting when you use this Ad-Sense theme. 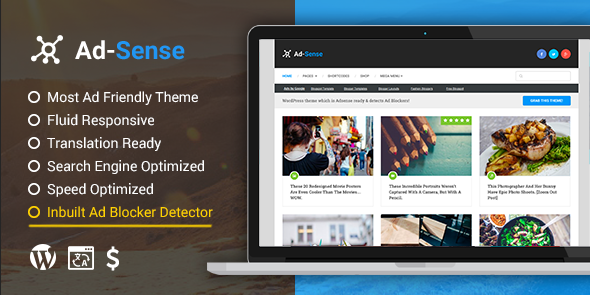 Make More Money, Get this Premium Ad-Sense Theme for Just $69 $47 Hurry up and grab this theme before it is too late. Apart from these, you get the usual features you expect from MyThemeShop themes like fast loading speed, SEO readiness, clean code, multiple customization options, etc.. Hurry up and grab this theme before it is too late. This is the only best theme that I got is perfect for maximizing the ad revenue for any wordpress blog.